Black and white negative of a photograph of the construction of the sewage treatment plant. The large cylinders have just been put in the ground. The Brock Street bridge over Highway 401 can be seen in the background at left. The addition to the sewage treatment plant was built in 1948 adjacent to the plant built in 1914. It is located south of Highway 401, east of the Victoria Street crossing. 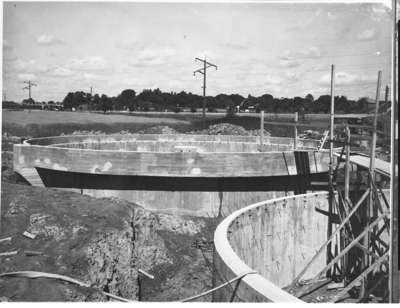 Construction of Sewage Treatment Plant, July 28, 1948, Marjorie Ruddy. Whitby Archives A2013_040_1623.